With school back in session next week, D.A. Ferguson Middle School and W.R. Myers High School are still well under construction. “Most people are aware at D.A. Ferguson and W.R. Myers there is construction. 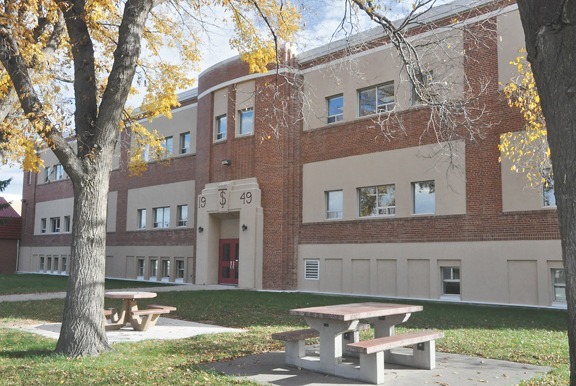 You’ll notice the front entrance of the high school looks a little different now that the big arch is gone,” said Wilco Tymensen, superintendent of schools at Horizon School board meeting on August 22. While the Horizon School Board was well aware that the school would be under construction for the entire duration of the school year, they weren’t aware that they were behind by several weeks. As school starts on September 4 at both schools, staff and students will have to adjust as certain aspects that they thought would be complete are not as of yet. With all that in mined, Francis says that staff and administration were aware of the situation. In the meantime, the gymnasium at Central Elementary School will be used for after school activities that require a gym. Physical Education classes for both D.A. Ferguson and W.R. Myers can expect to get plenty of fresh air during the six week period. “Phys. Ed class will be outside for the first few weeks,” added Tymensen. Another concern that has arisen is the condition of the school fields. As the irrigation needed to be off for part of the construction of a mandatory fire lane, they hope that both the grass and fire lane see completion before the kick-off school date. “If you look at the field, it hasn’t been irrigated recently and that’s because they cut up all the irrigation lines when they were putting in the fire lane around the east side of the building, that’s a legal requirement to have. Certainly, our hope was the sprinkler lines would be fixed this week and we could get some irrigation water on there as that field is used for extra circulars as well,” said Tymensen. With the modernization project behind their projected date, the board members had questions to the reasons why there would be a delay for the completion date. While the schools are both under the Horizon division umbrella, Francis pointed out that the projects were out of their hands at this point. He also highlighted the fact that the board should prepare for the completion of the modernization to be passed the projected August 2018 timeline.